Sackmakers J&HM Dickson Limited were founded in 1915 by John and Hugh Dickson to make hessian and jute sandbags for the first World War. Originally operating from a shed in Rutherglen on Glasgow’s South Side - the Dickson Brothers soon moved into three storey warehouse previously used as a Bleachworks in Millerfield Road, Dalmarnock. Both the directors and the workforce of 10 sewing machinists had reserved occupations and not required to sign up for military service. The company bought Jute and Hessian fabrics from Dundee merchants which were then cut up on table mounted circular knives powered by a system of pulleys & belts connected to large electric motors. The pieces of material were sewn together using Union Special sewing machines or stitched by hand. Sack reclaimers like Dickson also recycled used hessian, jute, twill & sisal sacks which came into the UK from Australia, Cuba, Turkey, Colombia, Argentina, Uganda, Uruguay & China containing a variety of coffee beans, flour, tea, cocoa, maize, peas, nuts, fishmeal, rice, malts & bone meal. The empty sacks were sourced from local mills such as Moorhead McGavin on the Broomielaw & often described by their appearance, origin or previous purpose. Stock lists dating back to the 1950's describe dozens of different types such as "Three blue stripe twill" “Peanut Hessian” "Botany Bagging" “Coffee Sisals” & "Australian Hessians". These sacks were cleaned out using large ceiling mounted suction machines called Blowers which sucked them inside out and blew the residue of the previous contents into large collection bags, to be sold on for various purposes such as animal feed. 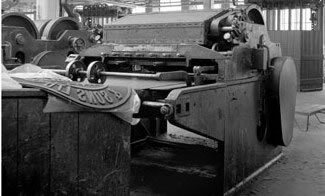 Any holes or damage on the clean sacks would be repaired on Singer darning machines before being resold to coal merchants or, in many cases, the bigger bags would be cut up and made into a number of smaller sacks for companies who made rivets, nuts, bolts & nails. Heavy industries were flourishing in the middle of last century due to the boom in shipbuilding, car making, heavy engineering & coal mining. Sacks to be exported would often be filled with components then dipped in oil which absorbed into the hessian material and prevented them rusting at sea. Dicksons recycled rolls of “painted hessian” fabric which had been used as endless conveyor belting by the Royal Mint to print banknotes - the green, blue and purple coloured material being converted into sandbags. They also recovered and repaired old botany bales which had brought wool from Australia and made them into ham wrappings for the meat market in the Gallowgate. Surplus Rayon fabric from tyre manufacturers was converted into bags, hessian was coated with bitumen and supplied to waterproof ships decks and railway coach roofs while 4 ply misprinted paper sacks were bought, split up into 2 ply sacks, sewn & sold on. In those days these activities were not looked upon by sack makers as recycling but as a way to make money from redundant materials. 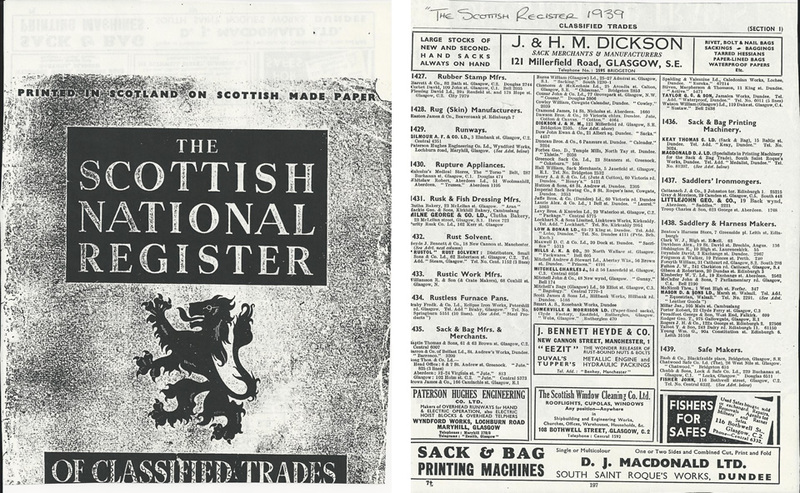 Such were the quantities of sacks being imported into the UK that in 1939 there were around fifty sack merchants, manufacturers & reclaimers advertising in the Scottish National Register for Classified Trades - including William Watson (Glasgow) Ltd and Levy Brothers & Knowles. Only J&HM Dickson Ltd and Levy Brothers (Now LBK Packaging) remain selling sacks from the original list. The factory in Dalmarnock was divided up into 3 storeys or "flats" and relied heavily on hand barrows, slings, ropes, sharp bale hooks, manpower & gravity to move the heavy hessian bales and sacks about. A single internal hoist operated through wooden trap doors on each floor lifting all the raw materials up to the top flat in cargo nets where the processes of sorting, cleaning, darning, sewing and printing began. The sacks were printed on large, hand fed, Sphinx bag printing machines made by Thomas Keay in Dundee. Printing plates were hand cut from canvas backed rubber or customers initials were created by simply assembling individual rubber letters and nailing them to the rotating wooden printing drum. Eventually all the finished bags found their way down to the first floor where gravity again provided a free source of energy as the sacks were literally thrown out of loading doors onto waiting trucks below. John Dickson died in the early Forties and Hugh's son, Bill, joined the company in 1945 near the end of the Second World War. Bill became a permanent member of staff after he finished his National Service and took on the role of salesman to help the company find more work for its now 20 largely female staff. Dickson's main customers around this time were local Coal & Industrial Merchants, rivet suppliers to Clyde Shipbuilders and bolt manufacturers such as Lanarkshire Bolt Company in Hamilton, GKN Birmingham, British Leyland in Bathgate and the Glasgow Steel Nail Company in Bishopbriggs who purchased "double twill bags" for their dog spike nails. Remaining competitors included companies such as LBK, William Burns near Ibrox and Thomas Boag in Greenock. With the war over, Dicksons continued to supply sacks into the industrial and agricultural markets but manufacturing industry in the UK was starting to decline in the 1960's due to cheaper products being imported from abroad causing heavy industry to go out of business or having to relocate overseas. There were simply too many sack makers chasing less business and consequently all were suffering from increasingly low margins. It was clear the company would have to adapt to the market and those competitors who stood still would simply not survive. The introduction of Woven Polypropylene Material (WPP) provided a welcome opportunity to bring a new type of sack to customers in the early 1970's. This material was made from woven plastic instead of woven jute, although it was non absorbent it proved cheaper & lighter than hessian but stronger, rot proof and easier to print. New heat cutting machines were purchased from Germany to handle the modern fabric and Dickson became one of the first manufacturers of WPP sacks in the UK. Their Union Special sewing machines & sack printers were easily adapted to handle the new material as customers replaced old heavy hessian sacks with the new lightweight versions. WPP sacks were here to stay and though sack reclaimers could still sell a few second hand bags if they had been carefully emptied, they were not economical to refurbish. Subsequently many old reclaimers vanished along with the heavy industry which had consumed so many bags for nuts, bolts & rivets. Companies able to make the new Polypropylene sacks like Dickson began to move into new markets - making bale covers for wool, yarn & synthetic fibre manufacturers, sacks for food ingredients & chemicals, shot bags and sacks for solid fuels, salts & sugars plus diverse products such as pipeline cushion pads. These long tubular sacks were hand packed with wood wool & formed a protective collar to prevent pipe coatings being damaged in transit, primarily used by pipe coating companies to protect subsea pipes en route to the booming offshore oil industry. Bill Dickson's son, Alan, joined the company in 1980 and Hugh Dickson worked on up until the day before he died at 82 in 1981 - three generations together for just over 12 months. Hugh was a respected member of the Glasgow Southside community, playing soccer at half back for Queens Park Football Club (The Spiders) before becoming President of the Club & a Scottish Football Association Commitee member (during which time his other claim to fame was meeting the Pope!) By this time there were only a handful of sack merchants and manufacturers left in Scotland. By 1985 the company's ancient premises in Dalmarnock had become dilapidated beyond repair, neighbours Calder Millerfield (Originally the Union Pie Company) moved on & Ferrarfelt, Bonnyman Chemicals and Kennedy's cooperage who all shared the old bleachworks site on Millerfield road had ceased trading. 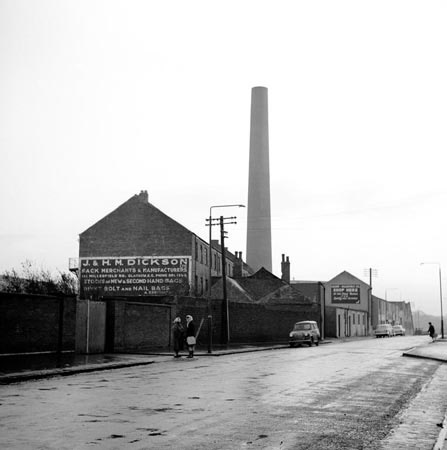 Dicksons old factory had served it’s purpose and now found itself in an increasingly deprived area of Glasgow’s East End so it was time to move on. 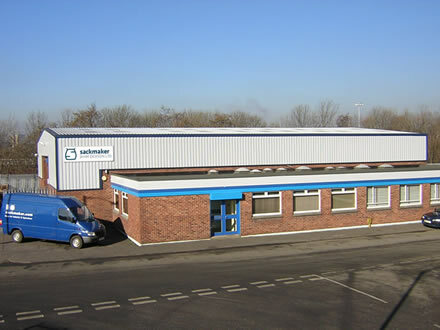 After working for 4 years through the ranks as a sewing machine mechanic, truck driver & factory manager, Alan Dickson set about developing the business in the same way as previous generations & relocated the company to premises 2 miles away in Seath Road, Rutherglen Industrial Estate. The estate was modern with a more efficient factory on one floor & the new unit sat on the banks of the Clyde beside the boatyard where the famous Clyde paddle steamer, Lucy Ashton, was build and launched. The old Dalmarnock factory failed to sell and was raised to the ground by vandals who set it alight a few weeks after it was vacated, the ground lying barren for 20 years until it was sold for redevelopment becoming the Athletes village for the 2014 Glasgow Commonwealth Games. Dickson began importing cheaper sacks from the Philippines, India & China to compliment it's range of manufactured bags & started making the new FIBC (Flexible Intermediate Bulk Container) bulk bags which each held over a tonne of product and had becoming popular in the chemical and agricultural sectors. These one tonne sacks could carry over 1000 times their own weight and proved a revolution in the bulk packaging sector, especially favoured by fertilizer and builders merchants. The company also used their sack making experience to great effect offering a bespoke manufacturing service which supplied a diverse range of made to order products such as pallet covers, wool sheets, mattress bags, & meat bags to protect animal carcasses during blast freezing. 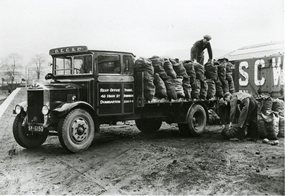 The imported sack business continued to grow and these “standard bags” were mainly used for fertilizers, feeds, seeds and packing everything from wool to scrap metal, aggregates, chemicals, waste paper plus Post Office Sacks and sandbags. The company has been involved in the brewing industry in more recent times, making Hop Sacks for growers in Worcester & Kent, cork filled pads for draymen to drop beer barrels onto when unloading at the kerbside & more diverse products like home brew sacks. Brewsacks had a polythene liner fitted inside them (rather like a modern wine box) which was partly filled with a sticky brewers wort mix. The bag was filled with hot water through a valve in the top, a sachet of yeast sprinkled inside then it would ferment over 4 weeks to make about 20 pints of beer. The idea proved very popular for around 3 years & over 250,000 were sold in the USA, New Zealand, Germany, Scandinavia and in the UK by Boots. Meanwhile, more container loads of various woven pp sacks were arriving from overseas to satisfy growing demand for cheaper prices - some of these were printed on Dicksons machines & sold mainly as prepack sacks for coal, animal feeds & other agri products like seeds. Many bags would find their way into the paper recycling, laundry & chemical powder industries or be used for packing firewood and shellfish. The advent of the Internet and the ability to quickly find products online proved a boon to such a specialised industry and in the early 90's the company also found itself involved in the recycling movement for the second time in its history. Pioneering the manufacture of the first kerbside collection sacks for a local company to collect old newspapers door to door was the first step towards the development of a broad range of Kerbside Sacks now used by local authorities to collect plastics, cans, newspapers and garden waste all over the UK. 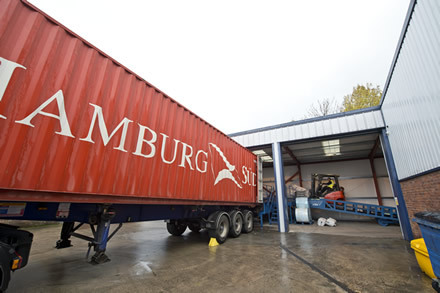 Glasgow competitor William Burns ceased trading around 1990 and as much of their business migrated across the city, neighbouring premises were acquired in 1995 followed by the construction of a container unloading facility in 2006 to handle to growing number of imported sacks arriving from overseas. 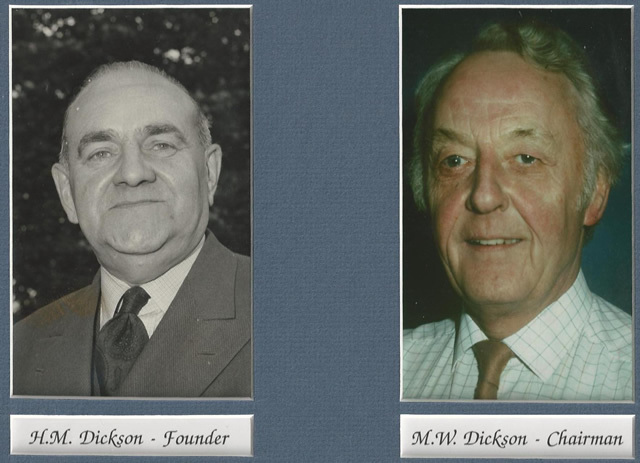 The second generation came to an end when Bill Dickson passed away aged 79 in 2006, he was still working part time as Chairman until just 10 days before his demise, a much respected member of the UK sack trade and Clydesdale Cricket Club. Present Day – 100 years in the bag! 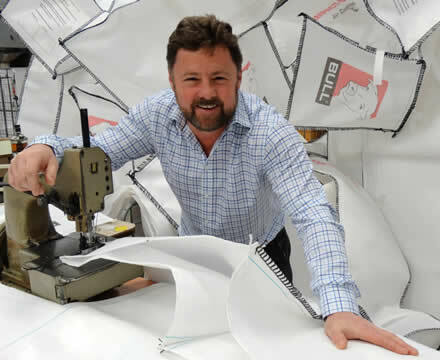 Alan Dickson continues to run the business with a staff of around 20 employees and retain their sack making facility in Glasgow with the majority of imported sacks manufactured in India and the Far East. The company continues to grow & is currently active in a broad range of Industrial, Agricultural & Recycling sectors – more recent developments include the manufacture of fall arrest bags for the construction industry, specialised Bulk bags and Roll Container Covers, horticultural planter bags & a range of patented Securesack™ Kerbside collection bags for recyclables, plus recent investment in a sandbag filling plant. There are less than 10 Woven Sack Merchants left in the UK and only 3 manufacturers including Sackmaker J&HM Dickson Ltd who mark their centenary in 2015. The next generation are on the way & the company is planning various events to mark its centenary - including expanding its operations into a new factory on the Southside of Glasgow over the next few years. This article is the property of Sackmaker J&HM Dickson Ltd 2015 and may not be reproduced without permission.